Some people sigh, hang up the lead and resign themselves to walking the dog in the spring, others might gently nudge their dogs out the door for much-needed dog winter exercise. 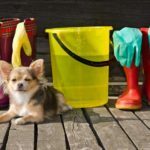 A few dog owners will put their dog out in the garden come rain or shine, to expel their energy, but find themselves regretting the decision when their floor is covered in muddy footprints and half the garden foliage. 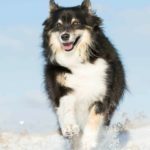 Here is some advice to make winter dog exercise something to look forward to, rather than something to dread. 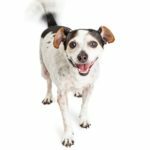 Your dog might not mind the colder, wetter weather, considering some breeds have naturally water-repellent fur however, you probably aren’t excited to get blown around in the damp outdoors weather. Research in your local area for a dog group or class that gets together regularly, you’ll be able to exercise your dog, get some important socializing in and stay dry, all at the same time! Training classes are offered all-year-round and accept pups from all walks of life and ability, so if you think your dog would enjoy trying out some agility or flyball, check out your available options. When heading out on a walk, physical needs aren’t the only requirement being met but your pet will get plenty of emotional and mental stimulation as well. 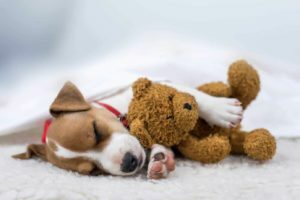 Sights, sounds, smells, all of this helps work your dog’s mind and contributes to a well-rounded, pooped pooch by the end of your walking adventure. Enrichment toys are a great way to help entertain your ‘furever’ friend while stuck indoors, puzzle toys that release treats, favorite toys that can be hidden around the home, wobble balls and anything else your dog takes a liking too. There are plenty of options and you can even make your own puzzle toys with the help of online resources, so they don’t need to break the bank. 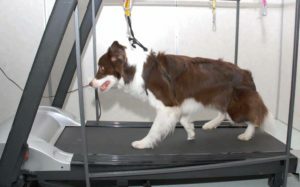 A fairly new domestic option, dog-friendly treadmills offer an excellent way to exercise your pet without heading out in the wet, icy or stormy weather. Some amount of training needs to be done and you should never force your dog to do something they are uncomfortable with, however, plenty of dogs have already taken to using dog treadmills and enjoy exercising alongside their owner in the home environment. Take up the messy turf and install a cleaner, low-maintenance option in the way of artificial lawn. 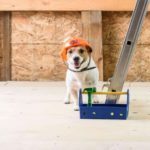 Not only can artificial turf be washed down quickly and easily with a hose, but there’s also no risk of muddy paws, worn patches, dirty, dangerous holes, and discolored areas. There are plenty of benefits to using artificial grass in your garden for your dog, not to mention, you’ll never have to look out over a patchy, browning mess but instead, your view will always offer a lush, green appearance, all year round. Sometimes, you are without an option and the dog is racing around the house, threatening to bring the décor down, so, it’s time to get outdoors and active! 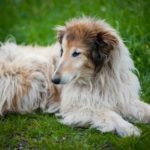 Dog breeds with a double coat, such as golden retrievers, huskies, German shepherds, etc, have evolved to be comfortable in the cold. However, short hair breeds like the poodle, pugs, and greyhounds do not do well in the colder weather and need extra layers to prevent illnesses. Always get advice on how to fit your dog with a coat, to ensure free movement and that you are knowledgeable enough to quickly remove it should the weather improve on your journey so to prevent your pup overheating. When you are getting outdoors, don’t forget to wrap yourself up with scarves, gloves and a hat (a lot of our body heat is lost through the head) and keep walks to a shorter time so neither of you catches a chill. Most importantly, have fun! 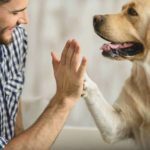 Owning a pet is a responsibility but that doesn’t mean you shouldn’t enjoy every second you get to spend together so get outdoors, splash in some puddles, go dashing through the snow and bond with your special pet. Make sure you keep some towels by the door! And let your dog have a good ole shake before you get in as this helps to remove as much as 70% of moisture from their fur, leaving you less to clean up.